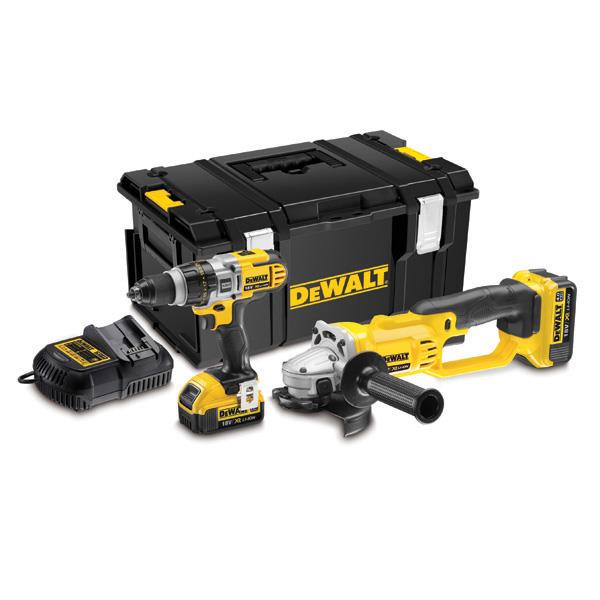 This DeWalt kit contains the DCD985 XRP Hammer Drill, DCG412 Grinder, DS300 Tough System Kit Box, 2x 4.0Ah Slide Pack Batteries and a Multi-voltage Charger. The DCD985M2 is an 18V XR Li-Ion compact combi hammer drill driver it has an ultra compact, lightweight design, which allows use in confined spaces. The DeWALT DCD985M2 has an intelligent trigger design, which allows for total control of the application. The DCG412M2 is a grinder with a powerful and highly efficient fan cooled motor with replaceable brushes, which delivers up to 7,000 rotations per minute for fast cutting and grinding applications and has steel cut spiral bevel gears which provide the highest level of durability and low vibration, increasing user productivity. The DS300 has all the benefits of the Tough System Technology and enough room to store most hand tools and compact power tools.